Whoops, it's been a while due to my Yuletide absence and I do apologise that. Anyway, I suppose it's time to get back to blogging and continue with Siouxsie Sunday series! Where were we? Ah yes, the mid-80s. Following Robert Smith's exit from Banshees for the second and the final time after first recording a live record Nocturne and then, a studio album Hyæna with the group, he was replaced with John Valentine Carruthers, previously from the industrial outfit Clock DVA. Before writing a proper new album, however, the Banshees chose to re-record a bunch of older tracks first, partly in order to integrate Carruthers into the group prior to the album writing process. The final results were released as a four-track EP titled The Thorn. Then, it was time to hit the studio again, but now with a whole new LP in their sights. 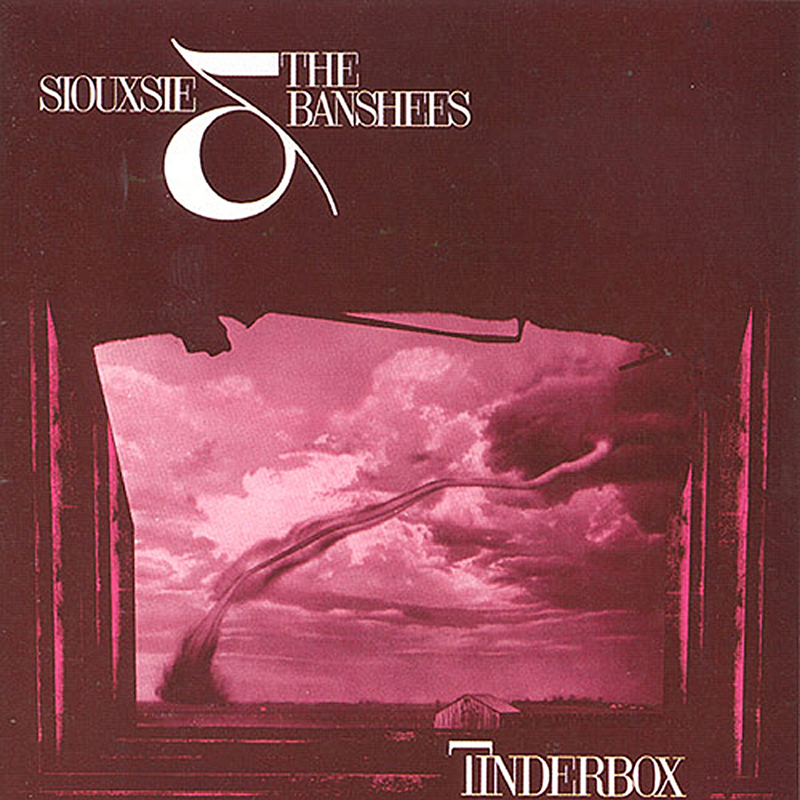 The album took quite some time to finish - they spent most of 1985 working on it - but finally, the following year, the Banshees' seventh studio album was released, and it bore the name Tinderbox. A much more focused effort than 1984's Hyæna, Tinderbox sees the band once again develop a specific style, a distinctive Banshee sound and then sticking to it. What I personally admire about Siouxsie and the Banshees is how effortlessly they could reinvent themselves, album after album, by developing a sound that was new and exciting but still always had that specific Banshee feel to it. You could probably hear a previously unreleased song and immediately recognise the era it's from. Despite yet another change in the guitar section, Tinderbox showcases how mature and confident the band was around this time. It's also one (and arguably, the last) of their more guitar-oriented albums in the vein of, say, Juju. Carruthers's guitar playing fits seamlessly in the group's music, most notably in the triumphant numbers "Cities In Dust" and "Land's End". Perhaps one of the key elements behind the band's longevity and reinvention were indeed the ever-changing guitarists who brought new ideas into the mix. The LP is kicked off by the dramatic "Candyman" that was also released as a single. Representing the Banshees' traditionally grim portrayal of childhood, the song paints a picture of a child murderer. It was apparently inspired by Ronald Clark O'Bryan, also known as "The Candyman". O'Bryan killed his son on Halloween by poisoning him with candy spiked with cyanide in order to get life insurance money. He also gave other children these poisoned treats in order to cover up. This is reflected in the lyrics: "Sickly sweet, his poison seeks / For the young ones who don't understand / the danger in his hands". Not exactly a Christina Aguilera kind of a Candyman, that is to say. "The Sweetest Chill" sees development in Siouxsie's singing voice, as well, and it feels like a natural direction from Hyæna, with her singing sounding even stronger and more mature than before and also, more theatrical. Juju and Tinderbox era versions of Siouxsie are probably the most iconic ones, but not exclusively because of the way she uses her voice (although in both cases she did reinvent herself as a completely original and previously unseen frontwoman), but also because of the visual side of her. Her hair was famously raven-black and back-combed and make-up dramatic, but her style was never quite as exaggerated and dare I say, even caricatural as during these two eras, which contributed to the fact that Siouxsie came to be known as a bit of a godmother of all things goth (even though she herself was not too fond of this label). Hell, during this time she even wielded a skull-headed cane and, according to concert-goers' stories I've read online, after she broke a leg during a concert, the rest of the tour she was escorted to the stage and back by men dressed as Grim Reapers! This was more likely for the sake of the group's twisted sense of humour, though, rather than to make a statement of any kind. While the record has its darker moments, it does have two surprisingly upbeat tracks: "Cannons" and "Party's Fall" - even though the lyrical content is obviously not all that summery and joyful, as you might expect from them. The former is almost a baroque poppy number driven by Budgie's drumming; the latter features some fine guitarwork by Carruthers. With a bit more uplifting lyrics it'd be a most beautiful little tune but of course it comes with a Banshee twist, as they do. Nonetheless, a Banshees album wouldn't be a Banshees album without the darker stuff. Enter "This Unrest" - a dramatic, powerful downtempo track that builds up into an amped-up chorus and comes with a theatrical, piano-reinforced bridge. Then there's "Land's End", a tragic story about two lovers stepping off a cliff together into the eternal embrace of the sea. The song has some stunning lyrics about the tragedy of a doomed romance; a personal favourite would be "Moths touched by flame repeat their fatal game". It's an epic album closer that's six minutes of atmospheric progressiveness, also deserving a special mention for Budgie and Carruthers' stellar performance. It is for songs like this that I feel that Budgie is criminally underrated as a drummer - he certainly falls nothing short of genius. Tinderbox yielded one major hit, the lead single "Cities In Dust", which also became a much-loved Banshee classic. The dark lyrics describe the destruction of Pompeii ("Oh, oh your cities lie in dust, my friend") and the song became a big hit in the clubs upon its release, even peaking at #17 in the US Hot Dance Club Play chart, thus gaining new Stateside audiences. Subsequently, it has been used in American TV/movie productions such as Grosse Pointe Blank (1997), Gilmore Girls (2002), and Out of Bounds (1986), which even had the band appearing in a cameo role, performing the song in a club (the exact scene can be found below). It has also been covered by Junkie XL and Pato Fu among others. A cover version by The Everlove was used in a trailer of the video game Transformers: Fall of Cybertron. However, even at only eight tracks, the album isn't filler-free. "92°" feels entirely pointless on the otherwise top-notch record and doesn't measure up to the other creative peaks of the album, instead sounding like a throw-away track - an experiment with the Tinderbox sound that didn't turn out too well but was included on the album anyway. Speaking of the soundscape, Tinderbox is one of the group's most coherent efforts, which could be regarded as both an achievement and a misfortune. On the one hand, the band developed a strong, distinctive musical style that not only set the band apart from its peers (and emulators) but also established the album as yet another unique reinvention within the Banshee timeline. On the other hand, due to the stylistic uniformness of the album, the songs don't necessarily stand out independently when detached from their context (with the obvious exception of "Cities In Dust") and thus, failed to yield classics from the regular album tracks. That being said, Tinderbox is clearly not intended to be a mere collection of potential singles or three-minute earworms - it's an album that's meant to be listened to as an album. And as such an album Tinderbox is very solid and conceptual, offering an intriguing 38-minute listen. Try at least: "Cities In Dust", "This Unrest", "Land's End"